I was at a SANS conference in Reston this past week and did a double take on seeing the following. I dont normally go to Reston Town Center, but given the number of infosec people working in the area I imagine the jokes are all pretty much done. 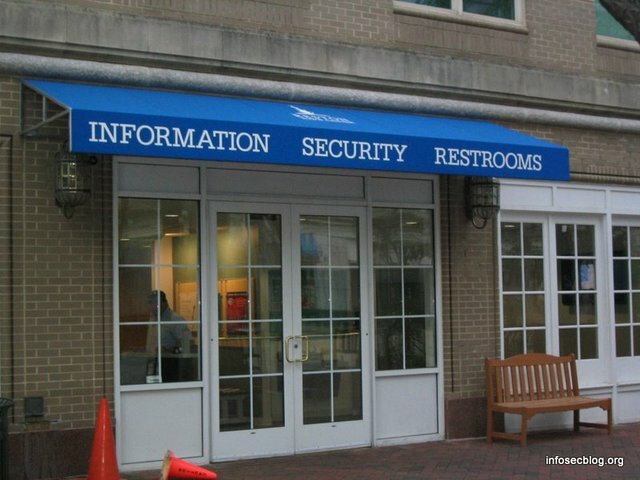 What is an information security restroom? If Larry Craig had used a infosec restroom would he still be a Senator? Is this restroom ISO27001 certified? How does this restroom support confidentiality? How does this restroom support integrity? How does this restroom support availability? Is it susceptible to a denial of service attack? Is there a Intrusion Prevention System?